Chongqing Qiao Feng Plastic Co., Ltd. was founded in 1980, the company now, there are 20 years of history. We Chongqing Qiao Feng Plastic Pallet Manufacture Co., Ltd. is a very specialized in plastic pallets, plastic pallets, plastic pallets, plastic floor panels, plastic pallets, plastic boxes, plastic containers, plastic baskets, food boxes, plastic boxes, plastic barrels, plastic turnover baskets, plastic sieve, parts boxes, parts boxes, acid bucket, plastic towers (tanks), tanks and other industrial plastic products, sales of large enterprises. 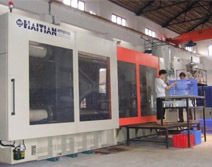 Our company has a number of sets of large-scale injection molding equipment, strong technical force, product quality, beautiful and durable.